The Paso Robles Police department is investigating a credit card fraud scheme after discovering devices designed to capture debit card and personal identification numbers at two area gas stations. After officers found the first skimmer at the One Stop Market at 2331 Spring Street, officers began checking other Paso Robles gas stations and discovered a second device at Steve’s Gas at 1441 Spring Street, police said. 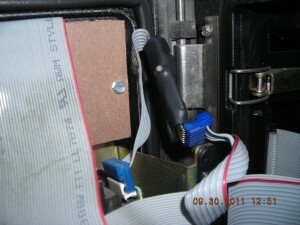 Skimmers are devices placed over the slot where one would insert a debit card at an ATM machine or self-serve gas station. The devises are designed to look like the real machine they are covering. Police believe the devices were installed by an organized crime group looking to collect credit card and debit card information. Police said that it doesn’t appear that consumer information was compromised because they removed the machines before they could be manually downloaded. Nevertheless, officers are asking customers who bought gas at the stations to monitor their accounts for strange activity. Why in the world report this at all? (I mean the police department . . .) Sit and wait or put security cameras on every one of these devises. I would think there would be existing security cameras picking this stuff up . . . or at least dummy cameras to warn these bad individuals off. Who will take the time to watch them? Who will take the time to interpret them? Man, I hope there wasn’t just these two… what kind of investigator announces ALL the ones found? I would have said, “Yep, we found one, but no others!” in a public fashion… then sat in wait at the second one (that I didn’t announce) and STING! Maybe there is a 3rd or 4th. Maybe I need to give the LEO’s more credit. I’m hopeful that we’ll hear of a sting soon… bust those Armenians (well, that’s who does it in L.A.). Why is it on all related stories of this scam the pump is open and what looks like the readers are installed inside a locked pump panel placed in line with the actual card reader equipment. So who’s the organized crime group, the gas station owners and oil companies? I don’t think you’re correct about what it takes to install these devises.. I believe what they install is a skin right on top on the reader. No need to gain access to the inside of the pump. If you think about it, all they have to do is pull a large vehicle in front of the pump they are going to rig. The inside attendant can’t see past that vehicle. Your right as I have no idea of how they work, it just that all the stories show the inside of a pump and what looks like in an inline computer or reader of some sort installed by the scumbags who rob the unsuspected users. It would have been nice if they had disabled the machines and then quickly replaced them so we could catch these little SOB’s. People would simply go inside to pay when they found the reader wasn’t working giving us the opportunity to spot the culprits attempting to retrieve the device. This is the 4th or 5th time that this has occurred in North County. I have made it a point to familiarize myself with my favorite gas stations card reader. if it were altered, I would notice it. When I can’t fill up there, I always pay inside. I think it’s time to start throwing the book at these creeps, we need to get to the ring leaders and kick their butts all the way to a long stint in prison.